The Drive Sight monitor is a simple monitor with one job: make sure external drives, including USB drives, and/or CD/DVD discs are not added to the system. 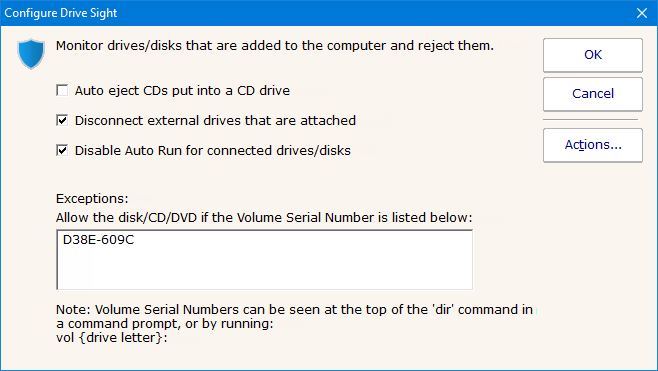 If a specified disk is added, it is immediately disconnected. These disks for which an exception has been added will be able to connect and stay connected. Like all monitors, this monitor has standard button on the right for Adding Actions. These actions would be fired when the Drive Sight monitor detects a new disk/drive and disconnects it. The action would typically be used to notify you.